Written by: Allie O'Neal on September 16, 2016. Brenda Cooper is a futurist who writes novels and short stories that take place in the future. 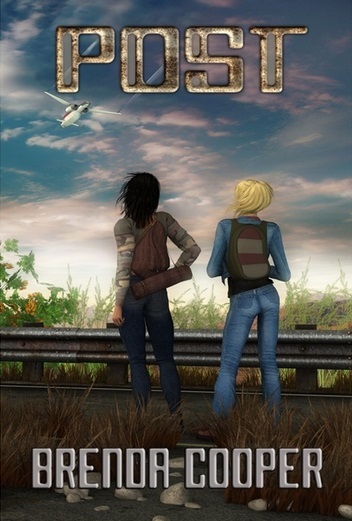 Her post-apocalyptic coming-of-age novel, Post, is being Kickstarted by eSpec Books. She took the time to answer some questions about her characters, world, inspiration, and how it all works together. Geek Girl Project: In your upcoming novel, Post, a teen girl named Sage escapes safety to look for hope in a post-apocalyptic coming-of-age story. Tell us about Sage. Do you consider her a role model? Sage is brave and curious. That’s really how I see many teenaged girls. When we first meet Sage, she’s led a very sheltered life, and been told what she can and can’t do so often she’s gotten sick of it and started to sneak out and explore the greater world on her own. This is very dangerous, but Sage believes in hope, and she’s tired of hiding out and waiting for the devastated world to get better. She wants to help it get better. She is also desperately lonely – there were no other children in her hideout for her to grow up with, and I think all teenagers know that while adults are good for a lot of things, they are not tribe. Teenagers need each other. She needs to find other teens and young adults. Yes, Sage is a role model. She’s leaving a safe and secure place and going out into the world to find her own way, which is something every teen needs to do. She shows courage. Geek Girl Project: What made the Pacific Northwest the perfect setting for your novel? First, I live in Washington State. POST is largely set in Oregon, but I can get there from here, and often do. I can write with more authority about the Northwest than I can about a region I’ve never lived in. Second, while it’s impossible to say what parts of the United States will fare better in climate change, it’s likely that the Pacific Northwest will do pretty well. We have a lot of resources. We have coastline but most cities probably won’t drown with medium-sized sea-level changes. We probably won’t have hurricanes or tornadoes or some of the other storms some people are predicting could happen in the future. People up here are pretty strong and we’re used to being in and interacting with the wild. So this is one of a few places that will probably survive a challenging time well, and help lead us all out of it. 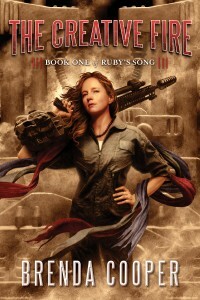 Geek Girl Project: What was the process of worldbuilding like? Do you have advice for worldbuilding? Worldbuilding is one of my favorite things. That’s part of why I write science fiction and fantasy. It’s so much fun to imagine how a whole new world might fit together. For POST, of course, the worldbuilding starts with what we have now, imagines a catastrophe (or series of linked catastrophes), and the kinds of social structures that might come out of that. For example, the last part of the book takes place in Portland, Oregon, and I got to try and figure out who might be able to hold a city together. I won’t say here because it’s a spoiler, but for a hint, I work for a city. Advice? Be complex. Look around our existing world and notice things. There are so many voices and religions and causes! Carry that complexity into the world you are making. You don’t have to tell your readers or gamers (game designers also build worlds) about everything you think of, and in fact, you probably shouldn’t. But think of it anyway. Then use that to create the small details that make your world more believable. I often try to draw my worlds out, especially fantasy worlds or for science fiction that’s set on other planets. Geek Girl Project: What were your inspirations for Post? One was a general reaction to post-apocalyptic fiction in general. A lot of it is set in really dark times when it seems like the main character is the only one who will live, and the story is about raw survival. I think the early stages of building a new thing are harder and more interesting. There is still enough real danger to spice up the story and making a future is so much harder than destroying one. Another is that while I am an optimist and believe that we can create a positive future for us and for the world, there are a lot of scary possible outcomes out there as well. Things could get bad. As a writer, there are times when I want to reach into my fears and write about them. Geek Girl Project: Can you tell us a little about what it means to be a futurist? What does that mean for your writing overall and this book in particular? What kind of research do you do when you are writing? Wow – that’s three questions! Well, there are many kinds of professional futurists. Some do really specific things like understand and report on the future of cars or the future of the steel industry. Many are able to be full-time futurists; I do it part time. I’m a generalist – I write fiction and non-fiction about many aspects of the future, I attend conferences about the future, and I give talks about the future. I do this because I think the future is really important to talk about and to think about. What we do affects the future, and so we might as well think carefully, and do our best to make choices that will create a future we want. Maybe the easiest way to say it is that to be a futurist, you engage with the future. I think whatever fascinates us (for me, one fascination is the future) informs the stories we tell. I think all of the things that I do and that I am go into my writing, and so POST is affected by my interest in the future. But when I sit down to tell a story, I don’t think about being a futurist. I just tell the story. I read every day – the news, books, social media posts from my friends (and I have really interesting friends – so I don’t mean posts about what they ate for breakfast). So in a way, my life is research. Then if I need something new, I read about it or I ask an expert about it. Geek Girl Project: What is your writing routine? Do you write every day? I try to write every day. This year, I’m in school for a master’s degree so I also have homework, and I’m balancing those two things. Right now – this month – I have a really big paper due in draft so I’m working on that every day, and after I turn in the draft paper then I’ll write every day for the next month, and then do the final paper. I’m pretty driven, so I don’t take much time off. Geek Girl Project: You have written quite a few books; what of your books might you recommend that look to the future, especially to a YA audience? 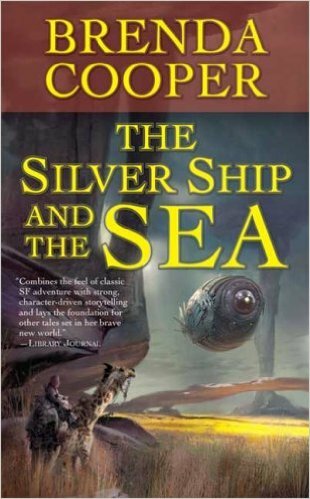 I really like my first few books for that – The Silver Ship and the Sea was recommended as a good book for teens to read and I actually think we missed an opportunity by not putting it out through the YA channels. It’s being reissued soon through WordFire Press, which I’m very excited about. The other book that’s a good place for teens to start is The Creative Fire, which a hard-SF adventure story aboard a generation ship. Geek Girl Project: What other authors do you recommend either in your genre or in general? What do you read for fun? Wow – there’s so many! I’ll try to group them. For YA, I love Paolo Bacigalupi’s Shipbreaker. I also love all the Mercedes Lackey books set in Valdemar – there’s a ton of them. They aren’t new, but they’re great. Start with the Magic’s Price trilogy. For fantasy, I really like Brad Beaulieu’s work – and Twelve Kings in Sharakai would appeal really well to older teen girls (and anybody else). I also like John A. Pitt’s Sara Beauhall series, anything – really anything – by Patricia Briggs, and I’m also addicted to Seanan McGuire’s Toby Daye books. Nnedi Okorafor is fabulous. I’ve enjoyed everything I’ve read by Lois McMaster Bujold. My favorite SF writers are Nancy Kress, Neal Stephenson, Octavia Butler, Greg Bear, and Kim Stanley Robinson. 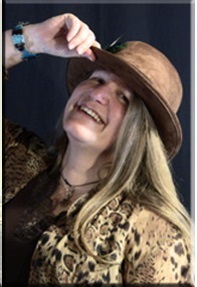 Find out more about Brenda Cooper at her website. Thanks for the interesting interview, and for hosting us! Let us know if you would like a review copy. Only available electronically right now, but I could get it to you today. I haven’t interviewed anyone in a long time, but she was fascinating to get to know.